Recently I was humbled to be to have the opportunity to designs a concert t-shirt for Eric Clapton. This kind of opportunity does not come up very often and frankly, I honored just be able to take part. Clapton is a music legend, and in my opinion, he is be admired for staying relevant and rocking for so many years. I have been doing some freelance design for a screen-printing company for which I used to work full-time. Pretty much all the t-shirt designs seen on my blog are from work I have done for this company. 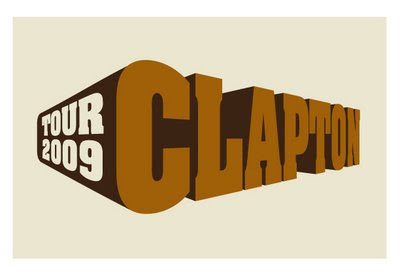 When I got the call that we would be submitting designs to Clapton's management I was ecstatic. The only direction they gave was not use Clapton's face or an image of a guitar. So here is the best of what I came up with in a two day dead-line. Sound Cloud: The concept was to combine psychedelic art with modern design. Rasta Clapton: The idea here was to capitalize on one of Clapton's best known hits; his remake of the Bob Marley classic "I Shot the Sheriff." Clapton Monument: He is so monumental in the history of rock that I thought it only fitting. I am still waiting on what Clapton's people think. In the interim, please let me know your thoughts. The good, the bad, and the ugly. congrats on the opportunity! i think the third concept is the strongest concept and design. it's just kind of like 'BAM! CLAPTON!" Indeed it's a great pleasure and opportunity to design for Eric Clapton. 3rd piece speaks for itself, looking at its simplicity and clean design, it's a great representation of Eric too! Thanks for your sharing on the health products but too bad it's not available in Malaysia. I am taking a few at the moment. Back to basic, I find taking the combine natural & health products really help. Have a creative week ahead and do rest well. Working towards a dealine need a lot of concentration. i guess the second is the best for me. I've been hooked on early Clapton lately,so I'm especially jealous. Just kidding... congrats, and great work on all three. "Sound Cloud" is definitely my fave. Great! I love the fisrt one! that's cool! congrats. i like all the designs! Thanks for the kind comment at Monday Art Day, the 1st and 3rd are my favourites. You have some great t shirt designs on your blog, really like the cassette tape one. Well first of all, Congrats! I like all three, but the last one moves me the most. I like the simple color scheme and the strong use of type. Look forward to hearing how it goes! These are wonderful. You are so on the concept. I love the the first one but think it could have been possibly been stronger. The second one blew me away, as did the third one. My favorite is the second. It's bold and it says everything. I think your work is fabulous. You are a wonderful talent. Obviously, that's why you were asked to do the job. Thanks for sharing with us. Good luck, and congratulations! Still on with the "Eric Clapton" project? Happy Labour day and creative weekends to you & family! YOUR DESIGNS ARE AMAZING!!!!! How wonderful to have such an opportunity. Congrats to you Man! THIS IS FABULOUS. Thanks for stopping by the blog and leaving such a encouraging comment. Thanks so much! Wow, huge congrats man!! I couldn't decide really - all of 'em should be used I think. Have fun (when you get a chance)!